and others, a complete list is available in update instruction. SolidTrustPay (STP) payment plugin update is also available for other softwares, to update, please replace the STP payment plugins files in "solidtrustpay" plugin folder. 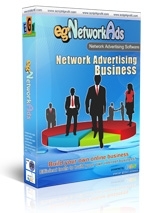 egNetworkAds is a new concept in Advertising while give income stream to your members. egNetworkAds is an advertising software works with Network ads, Classified ads, Text ads, Banner ads & Solo ads with Bidding System. Besides the advertising, your members will also earn Additional Income from the Network Marketing Plan such as Sponsor bonus, Level bonus, Order bonus, Reward point and more.. Please see more details at egNetworkAds Page. For a limited time only as new release promotion, we reduce the cost with 10% discount. Be hurry, because this promotion will be end soon. This is the only one software you need to run your business, no need to install another software because you have all needed feature to run your business. Work with Advance revenue sharing program, sell advertisement such as Classified ads, Banner ads, Text ads & Solo ads, Internal Ticketing System, Multi level network marketing program, Online content management and other powerful features. Please see more details at egRevShare Page. The update is available to download in your account area and update instruction is also available in the product tutorials. Please log in to your account area to access them. With this option, you can allow your visitor to enter their sponsor username on the registration page. This is needed for visitor who come without referral url or if visitor need to change the sponsor. Changes with EGOPAY payment & withdrawal module. Because EGOPAY changing they method of SCI & API, we update our products to be able work with the changes. So if you are using EGOPAY, you may update your current release. Now you can see Add fund, Deposit & Withdrawal activities with chart style in Admin home. The update is available to download in your account area at Script4Profit.com. Please login to your account area to download or to read the instruction how to upgrade your current release.